Sew Able dolls are soft body vinyl play dolls that are fully jointed. 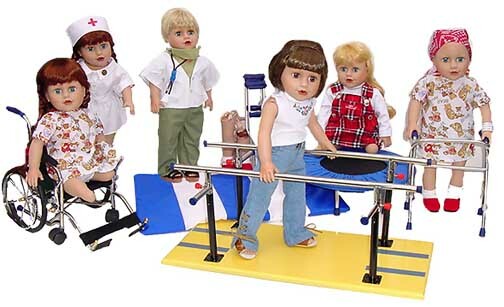 The unique feature of these dolls is the above-knee and below-knee prostheses. Some dolls are available without the prostheses but with a bald head (wig included), intended for children going through chemotherapy. You can also buy the dolls without prostheses or a bald head. The idea behind the Sew Able dolls is very admirable. Children who have had amputations or who have lost their hair from cancer treatment can have a doll who they can relate to. Children without disabilities, especially if they know a child with them, can have a doll that they can bond with and interact with in order to understand the challenges these children must face. We have been working on this idea for several years now and it has finally become a reality. The dolls started from an idea and were molded and changed again and again until there was a final design. From the dimples in the face to the hand-painted porcelain look, to the complex prosthetics made to fit them, they were all designed from a dream. There is a hope that one day all children will have a better understanding and acceptance of us each as unique individuals. We all have differences that make us who we are. Now with a patent in the U.S. and internationally, these dolls have finally arrived! We hope you will enjoy them :) They will need a lot of love and attention as all children do ! We will be donating a portion of the sales that are made from the dolls to hospitals that help children. These dolls are expensive at $115 but they were pricey to develop and are very limited edition. There are many dolls to choose from (9 with prostheses, 3 with bald head, 3 with neither), and they have a boy too. They are not cutsie-sweet enough to appeal to the mass market, but for the right child, this doll may be just the friend she needs to help her through a difficult time.